Can I share my output flash page-flipping book on Facebook? After create page-flipping book, magazine, comic, or catalog, I guess you mustn’t view it yourself. Yes, for the reason of sharing, we quite often hope to share the amazing digital flipping book with others. As you know, FaceBook is a very popular communication platform. There are too many people like communicating with friends on it. I think it must be the golden opportunity for you to share your stunning book, why let it passing you by. So therefore, take actions! 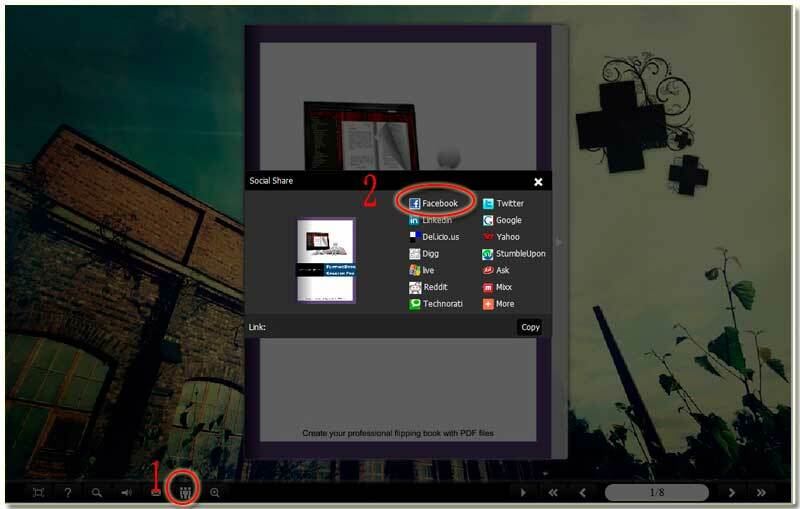 Let’s learn how to make use of the function provided by FlipBook Creator to make people share your online book by FaceBook. At first, we should confirm whether we open the social share functionality. Anyway, it is always is displayed on the tool bar on the preview window as a default facility. If you hide it carelessly, please open it at the left edge option “Design Setting”. 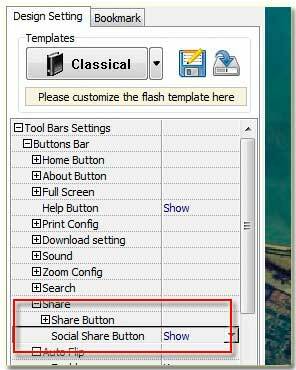 Turn to the options “-Tool Bars Settings --> Button Bar --> Social Share Button”. Don’t forget click the top requirement button of “Apply Change”. Alright, now we can build page-flipping book and then save the output files in one folder in our disk. Generally, after the flipbook created, immediately it will be launched in your browser. But, anyway you should upload all the files on your web server and then visit by entering its URL in the browser address bar. At that time you can click the icon “Social Share” at the menu tool bar as the illustration shown. Step1: Click the first icon of FaceBook, and then go ahead to the interface of log-in Facebook. Step2: With your registered account you can log in. 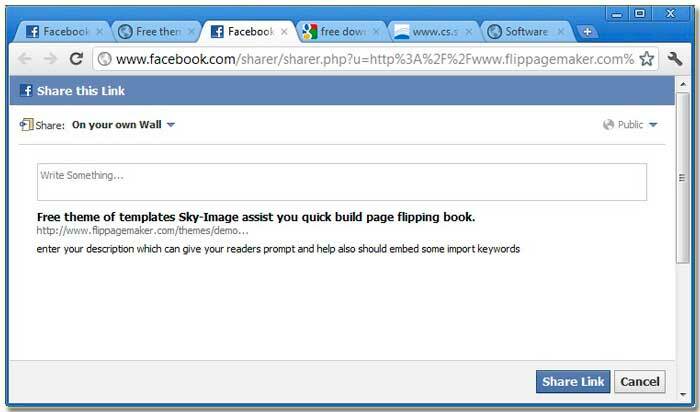 Step3: Describe your page-flipping book, and then submit that you have shared the digital book with all you friends on FaceBook.